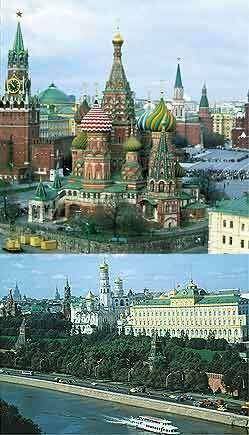 .| Hotels in Moscow |. Moscow, the capital of the Russian Federation, was founded in 1147 by prince Yuri Dolgoruky as a fortress on the bank of the Moskva river. Within over 850 years of its history Moscow has developed into the one of the largest cities of the world with a territory of almost 1000 sq. km and a population of about 9 million. It is the economic, political and cultural centre of Russia, the seat of the Russian government. There are a lot of inland and foreign companies, educational and cultural institutions in the city. Moscow is famous for its architectural and cultural monuments of world significance: the Kremlin (15-17th centuries) - the former residence of the Russian tzars is considered to be one of the most beautiful architectural ensembles in the world, the St.Basil`s Cathedral (1551-1561) - the masterpiece of Russian architecture is located on the Red Square. Moscow is well-known thanks to its theatres and museums. The Bolshoy Theatre (1776) - one of the leading opera and ballet theatres in the world, the Pushkin Museum of Fine Arts, the Tretyakov Gallery, the Historical Museum, the ancient estate Kolomenskoye (14th century) - one of the residences of the Russian princes and tsars, the Kuskovo estate (18th century) are among them. The Moscow metro is one of the most beautiful in the world.